Churchill Villa is nestled in the popular Highlands Reserve community, in Davenport, Florida and is perfectly placed for the shops, restaurants, fun and attractions that Orlando has to offer. This villa was completely remodelled in 2009, complete with tile floors and vibrant paint colors and is absolutely stunning. With 4 bedrooms and 2 bathrooms, this fully air-conditioned, family friendly vacation home is perfect for extended families, friends traveling together or for those that just need a little extra room, sleeping up to 10 people (even more if there are babies!). Churchill Villa has a comfortable family room to relax in during the day or evening with flat screen cable TV, stereo and DVD player to enjoy your favorite movie or listen to your favorite music. The villa is equipped with WiFi and there is a flat screen TV in every bedroom. There is even more fun and entertainment in the private games room. With a pool table and fooseball, you won't want to leave! Step out from the family room under the shaded lanai, and sit and eat al-fresco, while enjoying the beautiful Florida weather. Step on to the huge sun-baked screen enclosed pool deck from the master bedroom, and dip in to the cooling and sparkling waters of your own private pool (with optional pool heating)! The kitchen has been equipped with everything that you could need to provide a family feast to enjoy together either at the dining area off the main family room, at the dining nook in the living room or out by the pool. Luxurious sleeping accommodation awaits you when you stay at Churchill Villa with 2 King Bedrooms, one with an ensuite, and 2 rooms each with two twin beds. There is even a queen sleeper sofa, for when your group needs a few extra spots to lay their heads! The villa is also supplied with a pack and play cot, a highchair and an umbrella stroller, so that even the smallest guests will be comfortable. 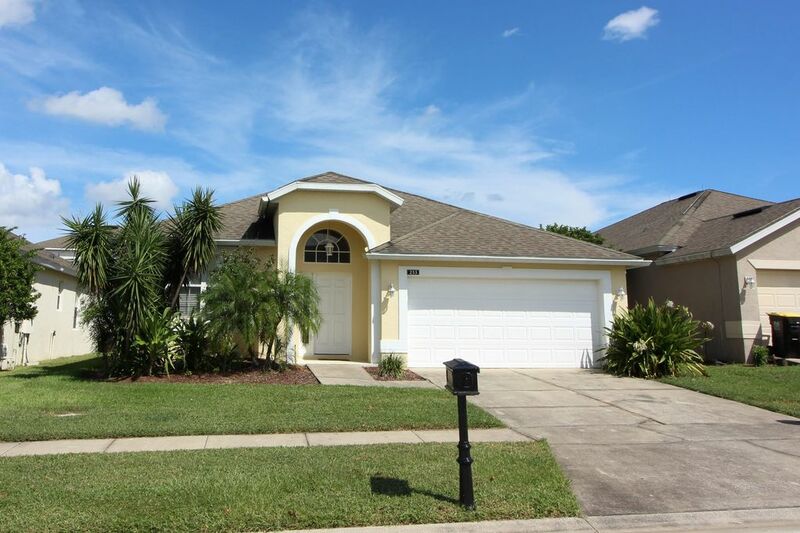 Highlands Reserve is a beautiful community off highway 27 and Sand Mine Road approximately 10 miles from Disney. There is a shopping center with a grocery store and many tasty restaurants within 5 minutes, and another power center with many big many department stores 10 minutes away. Highlands Reserve is a quiet, peaceful community with a beautiful Golf course and a community pool, playground and tennis courts. We enjoyed our stay. Can't go wrong staying here. Thank you Gail, we are glad you loved your stay. Please come back and visit us again soon. House was very clean and very spacious. Thank you Maria, we are glad you enjoyed your stay. Please come back and visit us again soon. House had a great layout and we really enjoyed our stay. Met our needs perfectly. Thank you Justin, we are glad you enjoyed your stay. I couldn’t of asked for anything more. Everything was perfect. Don’t even have one complain. I want to rent the same house next year. Angie was sweet and always available for questions. Thank you Ada, we appreciate kind remarks and look forward to your stay next year. It was a nice experience and we enjoyed our stay. Thank you Wilfredo, we are glad you enjoyed your stay.